Install new and/or replace residential and commercial heating, air conditioning and ventilation units and equipment for optimum temperature control and air quality. May perform a variety of duties, such as sheet metal ductwork/installation, gas/refrigeration piping, electrical wiring and/or plumbing. Great potential and job security within HVAC industry plus great opportunity to learn and grow with a knowledgeable, reputable, growing HVAC company. 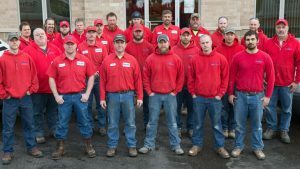 Join our team of dedicated, fun employees and experience the personal satisfaction that comes from providing customers with quality energy efficient products and service. Great pay and benefits package!